Levi Petty: It's A Boy! Today we had an ultrasound and were able to see that we are having a boy. 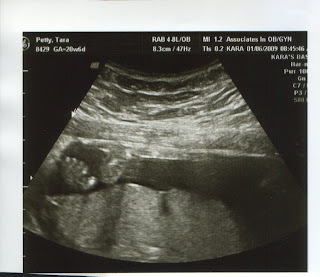 The ultrasound was wonderful. We could see him moving around a lot. At one point he turned his head and appeared to be looking at us. 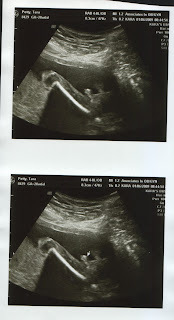 He was swallowing and we could see his mouth moving, and he kept waving his fists around. It was amazing! While our boy was cooperating to show his parts, he wasn't cooperating to be in a position the tech wanted to measure everything. 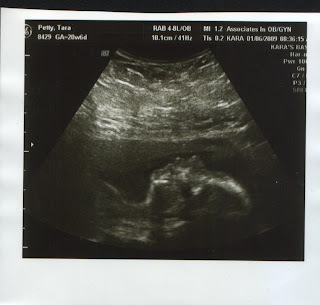 So we get to have another ultrasound next Friday, and hopefully he will be in a better position.The pictures aren't that great for the same reason. A wonderful profile shot of our baby boy. Proof that it is indeed a boy. There is an arrow in case you're not sure what you are looking at. Here is one of his feet. Now I guess it's back to the drawing board for names, right? I'm very happy for you and your little guy. Wow- amazing. It is so crazy to think that you are growing a person. All the dizziness is worth it, isn't it?!! Yea!! We are very happy for you both. So....have you decided on a name? Yes, Lindsey the dizziness is worth growing this amazing child. congrats girly! <3 that's awesome!